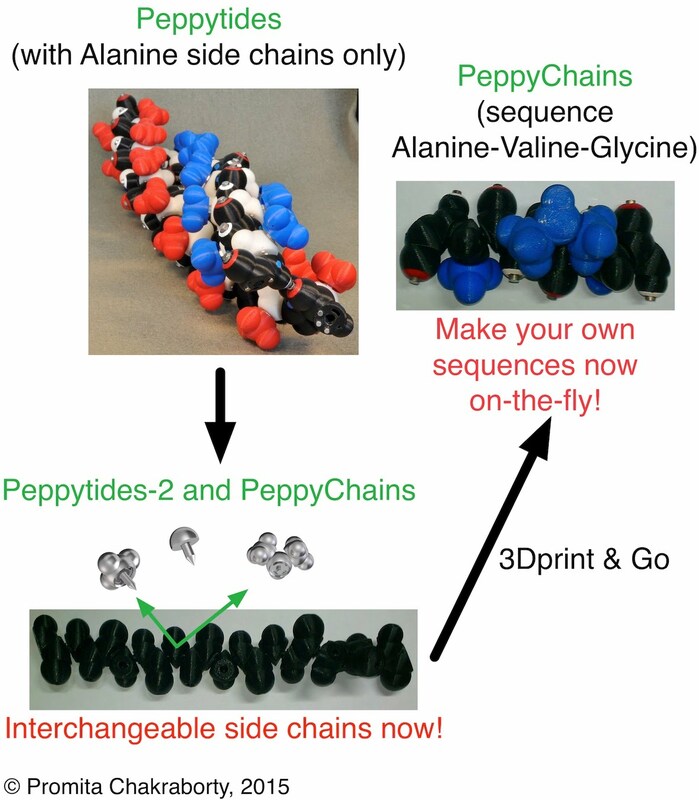 What: Peppytides are physical models of polypeptide chains that anyone can hold and fold and interact with! PeppyChains and Peppytide-2 are newer versions of Peppytides that has the added feature of interchangeable pluggable side chains. At this point, I am only providing STL for Alanine, Valine and Glycine side chains along with the backbone STLs, but the rest of the side chains can easily be made by extending this concept. PeppyChains: To minimize assembly, the entire backbone chain is 3D-printed as a whole. More information about making it can be found at NIH 3D Print Exchange with PDF . Arxiv article (PDF). Peppytide 2: This version builds on top of Peppytides to add the interchangeable side chain functionality. While Peppytides is only poly-alanine chain, Peppytides 2 supports pluggable side chains, and I provide 3 pluggable side chains to begin with (Ala, Gly, Val) to make various sequences with a permutation and combination of these three. Why these physical models: Understanding protein folding pathways has been a long-standing grand challenge in computational and structural biology. It is very difficult to visualize in our mind how the polypeptide chains fold into various secondary and tertiary structures. 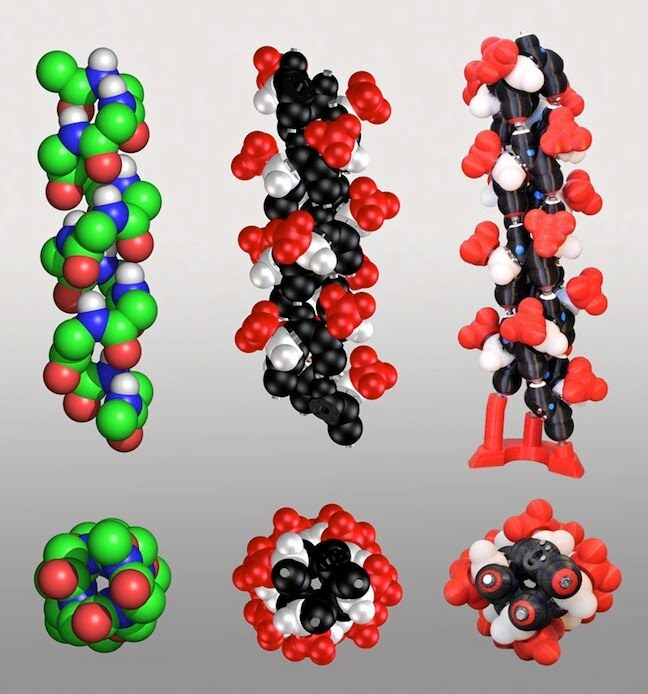 We believe that playing with a physical, foldable model of a polypeptide chain may result in unexpected and surprising discoveries, or even just a deeper understanding of the existing state-of-the-art. With this vision in mind, we designed Peppytides! What does it look like as folded structures: Here's is the model folded into the most frequently found secondary structures found in proteins. You can make one yourself. The details of Peppytide assembly are in the Assembly page. The picture below shows Peppytide coiled into an α-helix (right). It has been compared with its molecular counterpart from leucine-zipper (left), and a computer representation (center).